DBA were originally employed to provide the design and obtain the necessary construction consents for this development. Following on from the original commission, DBA were subsequently appointed as Contract Administrator for the project. The role incorporated Contract Administration and full time Site Supervision of the advance infrastructure works contract. 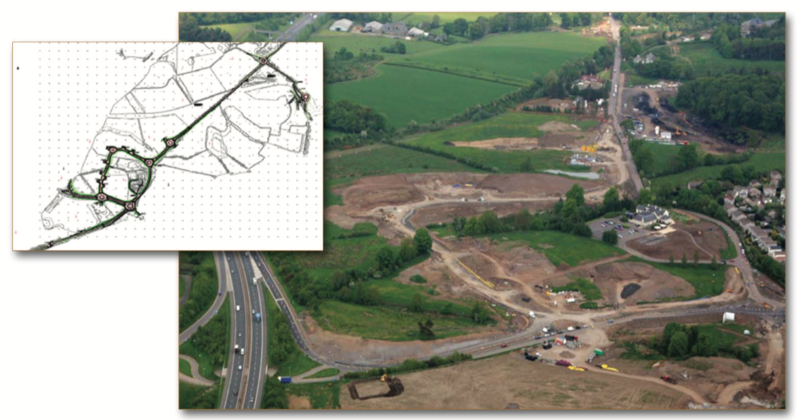 • Construction of approximately 4km of roads for both Local Authority and Trunk Road areas including Motorway Slip Road realignment, Dual Carriageway Section and construction of 7 Roundabout Junctions. • In excess of 2.5km of Drainage installation works including over 400m tunnelling works and Attenuation storage structures. • Peat Removal Contract (circa 70,000m3) and Contaminated Land Remediation. The on site role of DBA included Liaison between the Client, Management Contractor and Design Consultants, and also ongoing liaison with Statutory Authorities for Roads and Drainage issues.